Understand use of dashes and transfer knowledge to help improve writing. Use a DASH to set off words that interrupt the main thought of a sentence, or to show a sudden change of thought. Example: The robber ran right by me - I could see his sweaty face - an disappeared down the alley. A DASH can also be used to introduce information or an explanation. It can be used to mean "in other words" or "that is." Example: There's only one way you'll ever get me to jump out of an airplane - make sure it never leaves the ground. 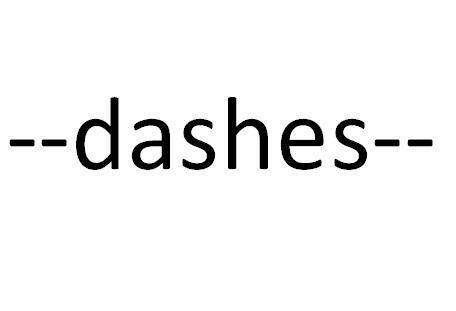 Image: "Freelance Writing Tips: Using En - and Em – Dashes in Sentences | Suite101.com." Steve Farmer Writing Profile | Suite101.com. N.p., n.d. Web. 23 May 2012. <http://steve-farmer.suite101.com/freelance-writing-tips-using-en---em--dashes-in-sentences-a321714>.